What is the Sign Up Cut Off Setting? - What settings control member actions? - What are Member Access Hours? How do I view and adjust the new member Sign up Cut-off setting? To view your sign up cut off settings, click on the Settings icon from the left and select General Settings (under the General section). 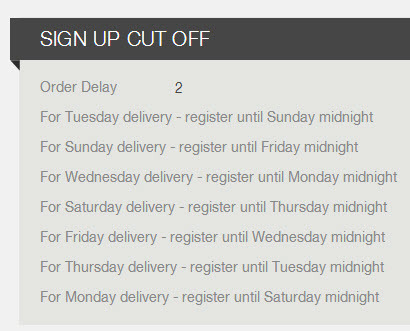 In the example to the right, the Order Delay is set to 2 days. This means that if a member wants to sign up to receive deliveries at a Tuesday location, they have to sign up before Sunday at midnight to receive their delivery on the next scheduled Tuesday. If they sign up after Sunday at midnight, their first delivery will be scheduled for the following scheduled Tuesday. Click on the Edit button in the upper right corner, to change the number of days next to Order Delay. Then save changes to see the new setting. Ask Yourself: How many days in advance do you need to know about a new member sign-up in order to prepare their share for the upcoming delivery? One day, two days, three days? Maybe you need an entire week. How does this appear to a member? Let's review an example: The order delay is set to 2 days. If a new member wants to receive their deliveries on Tuesday and it is after Sunday at midnight when they sign up, their first delivery will be automatically scheduled for the following Tuesday scheduled. The member will see their first delivery date in the green order Summary box. They will also receive an automatic response email to confirm their signup, which may include the dynamic field for "Next Delivery Date". How can I make an exception? If you decide that you do want to deliver to a specific new member for the upcoming delivery, you can go into their member card and activate their delivery as shown below. Use caution before removing the delivery hold! As soon as the new member signed up, they received an automated email indicating when they may expect their first delivery. If you remove the hold for that coming week's delivery, remember to email them and notify them that their first delivery date has changed. Also, if you pro-rate you shares, please be aware that the new member will not have paid for this extra delivery.